The connected objects, also named as smart devices, are now very popular and influential in our lives; their design is a hot issue for education in universities around the world, notably, in China, where some universities are updating their programs, and are evolving from traditional Industrial Design to Interaction (IxD) and User Experience Design (UX Design). 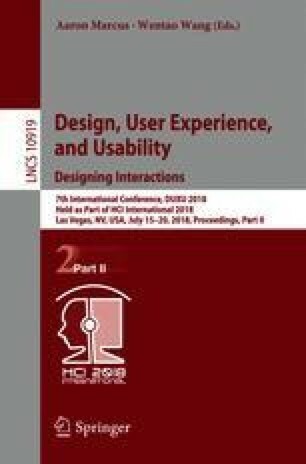 To this respect, we observed a gap between the IxD and UX Design methods as they are presented in most academic literatures, and the design processes employed in the professional activities; we found this gap as evidence not only in China but also in Western countries. In this context, this research aims to study how to effectively include IxD and UX Design methodologies in the programs of Industrial Design academic courses of an art backgrounded university, so to raise the ability of students to design connected objects, while maintaining the skills that are characteristics of the traditional Chinese design schools. In this research, we use China Academy of Art as the experimental environment as it is a typical art backgrounded university, and due to the cooperation with the authors. Our main focus is on the Chinese design system, and we aim at defining education programs for university courses, so to make them coherent with the professional requirements of the IxD related industry. The results produced in our research have a more general interest since some conclusions we achieved can offer hints for a critical thinking and a theoretical contribution about IxD tools and methods.